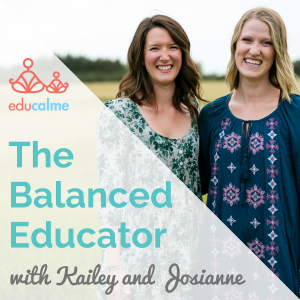 The lovely Kailey and Josianne from Educalme are back today, with the second part of their introduction to mindfulness series. Today they are sharing all about how to practice mindfulness with your kids. You can read part one of their series, about how to start your own mindfulness practice here. My kids and I have been practicing mindfulness for the past several months and it has been such a wonderful addition to our day. 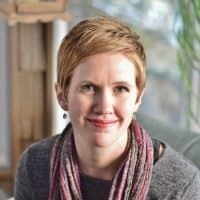 But in the beginning, I was unsure how to share and practice mindfulness with my kids, even though I had my own meditation and mindfulness practice. The Educalme Family guided mindfulness program was exactly what we needed. It has made it easy to introduce mindfulness to my kids and learn to practice mindfulness with them. I highly recommend it if you are looking for a simple way to practice mindfulness with your kids. My daughter started grade 1 last year, and it was not easy for her. She has a lot of stress and anxiety about going to school, along with being a Highly Sensitive Person. It was a challenging year for all of us and heartbreaking to see her experiencing so much stress. We tried all kinds of strategies to help with her stress and anxiety, and are continuing to do so. Adding the Educalme Family mindfulness program has been one of our favourite coping strategies we’ve tried. Even my 4-year-old joins in our morning meditation time, which I love! Within Educalme, they have programs designed for use in a classroom setting or at home with your own kids. The Educalme Family program provides a library of guided meditations designed specifically for kids. It makes it so easy to practice mindfulness with your kids. The meditations are short, which is great for kids, and approach mindfulness using language and concepts that are perfect for kids. And besides the mindfulness skills and coping strategies my kids are learning, our morning meditation is a lovely time to come together and take a few minutes to slow down and connect during busy mornings. Any time of year is a great time to start practicing mindfulness yourself or with your kids. But as back to school time is quickly approaching, it’s a great time to start a mindfulness practice. This is the time of year we are getting ready to re-establish routines and schedules after the summer break. Adding a few minutes to your morning routine to practice mindfulness is a great way to add some calm and intention to your day and your kids’ days too! Here are Kailey and Josianne with a simple guide to practicing mindfulness with your kids. Be sure to check out part one of their series here, to learn about starting your own mindfulness practice too! Mindfulness – the new buzzword. We hear it so often lately, but what does it mean exactly? And why is mindfulness so popular these days? Well, because people are experiencing, and science is proving that this thousand-year-old practice has many benefits. There have been thousands of studies done in very recent years on meditation (a component of mindfulness) and the brain. This research shows that meditation has an incredible amount of benefits for us physically, mentally and emotionally. Practitioners of meditation are less stressed and anxious, more compassionate, positive, focused, creative, happy and self-aware. Sharing a mindfulness practice with our children gives them tools for living happy and healthy lives. There is a growing body of research demonstrating that mindfulness programs for children help to lower stress and increase self-awareness, helping children and teens to process emotion in a healthy way. One study demonstrated that students practicing mindfulness in school benefited from increased attention, higher attendance and grades in school, a reprieve from outside trauma, better mental health, increased self-awareness and self-regulation as well as social-emotional development. Mindfulness is simply noticing what you are experiencing in the present moment with curiosity, openness and non-judgement. There are two major components to mindfulness – the formal practice and the informal practice. The formal mindfulness practice is practicing mindful meditation explicitly with a guided or self-guided exercise. This could involve sitting silently and paying attention to your breath. The informal practice involves applying what has been learned in the formal practice to your everyday life. An example could be really noticing and appreciating all the smells and flavors of your food. Mindful meditation is simple, but not always easy. A great way to start is with a breath awareness practice. The first couple times you practice with your kids, be sure to choose a time where they are already pretty calm. They will be more receptive and will have a better first impression. Forcing them to sit still when they have lots of energy will make them feel like mindfulness is a punishment rather than a useful tool for relaxation. Put your phone on airplane mode and set a timer for 5 minutes. And if 5 minutes seems too long, make it 2! The intention is that this practice feels good and uplifting, not like another chore on your to-do list. Sit on the floor or in chairs, and close your eyes. Don’t expect your children to sit completely still for the whole practice, it’s ok if they fidget a little bit. Give yourself and your children the permission to have your own unique experiences during this practice. Notice with as much detail as you can how it really feels to inhale and exhale. Instruct your children to imagine that they are aliens that have never breathed before. Their job is to curiously notice: What does breathing feel like? How does it make my body feel? The idea isn’t to not think, it’s to notice when you are thinking. Every time you bring your attention back to your breath you are training your brain. 5. When the time is up, reflect on your mindfulness practice. Ask your children questions like: How did your body feel during the practice? What did you notice? What was your mind doing? Then share your answers. There is no right or wrong experience to have during a mindfulness practice. Sharing is a great way to connect with openness and curiosity and to see that sometimes we have similar experiences and sometimes our practices are very different. Just like with any new exercise, this may not be easy in the beginning. But with time and practice, you will see that concentrating on the breath will become easier and a sense of calm will follow. It can be very helpful to learn this practice from a teacher. A great place to find quality guided mindfulness practices online is Educalme. They create mindfulness practices in both English and French for you to do with your kiddos so that the whole family can practice together. Educalme’s guided mindfulness practices use vocabulary simple enough for kids, yet valuable for teens and adults too. Plus, the 5 minute guided audio is really easy to fit into your day. Be patient and compassionate with yourself and your children as you begin this practice. You can’t be good or bad at mindful meditation. If it’s hard to sit still, that’s ok! If your brain just won’t stop thinking, that’s ok too. And if your emotions seem to amplify in the silence, that’s fine too. There is no right or wrong experience to have during meditation. Be flexible and experiment with practicing mindfulness at different times of the day. Try practicing first thing in the morning or right after everyone brushes their teeth to start the day off feeling calm and balanced. Or, make it a time to connect and relax as soon as everyone gets home at the end of the day. Or practice right before bed and drift off to sleep more easily. If your children don’t want to practice with you all the time that’s ok. Continue to do your own practice and to model it to our children. When they are ready, they will join you. Learning mindfulness is like learning to read. It takes practice and over time we see an invaluable new skill develop. A great way to make mindfulness a habit is to make it an integral part of your daily routine and to always practice at the same time and in the same place. Once you’ve experimented a bit and you’ve found a time that works for your family, stick with it. With practice, you will see that the skills you and your children are learning during your mindful meditation will naturally spill over into other parts of your lives. One day you’ll catch yourself being less reactive in stressful situations or being able to keep your cool during high-pressure moments. You may catch your children breathing deeply when they are feeling a big emotion or using their favorite Educalme breathing strategy like five-finger breathing. You may notice an increase in compassion towards self and others in your household and you will probably begin to appreciate the seemingly small moments of your life with your children more fully and feel more gratitude in your day-to-day. A fun informal practice to try with your kids is eating mindfully – using all 5 senses to eat slowly as you really notice all the layers of your eating experience. You can get a free mindful eating activity in The Balanced Educator Resource Library. Mindfulness helps us to notice and appreciate the present moment fully so that we can experience more joy and appreciation in our everyday lives. Have fun curiously exploring this practice with your children. Great article and reminders on how to teach a personal passion. I never really think about how to teach this process. Thank you for the tips. Great tips, it’s never too early to start this with your kids. Thank you for this post! We will have to try it in our house, to help build more calm and self control!